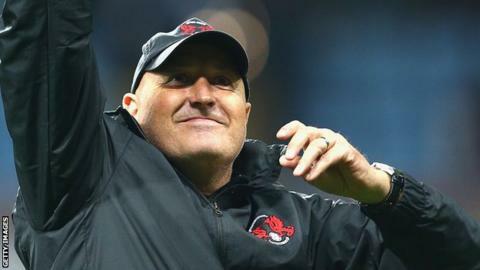 Cardiff City managerial target Russell Slade fears the Bluebirds will look elsewhere after their approach for him was turned down by Leyton Orient. The Bluebirds are still interested in talking to the Orient boss about their vacant post, BBC Wales Sport understands. On Monday, Orient rejected an approach for 53-year-old Slade, who has been their manager since 2010. "It's frustrating," Slade said after Orient's defeat by Sheffield United. "It's been turned down and that's all I can say, and whether Cardiff come back again I'm not sure. "Maybe they'll move on. It's a big club and it will be a big job for somebody that eventually ends up with [it]." Championship club Cardiff have been without a manager since Ole Gunnar Solskjaer stepped down last week. BBC Wales football correspondent Rob Phillips said: "I understand Cardiff are still talking. They want him." Slade - named League One Manager of the Year for the 2013-14 season - has been one of the favourites to take over since Solskjaer departed on Thursday. Scott Young and Danny Gabbidon, who have been put in caretaker charge, oversaw Saturday's 2-2 draw at Derby and Tuesday's League Cup defeat to Bournemouth. "The feeling in the club and the hierarchy is that Scott Young should be given some sort of role in whatever new regime there is," added Phillips. "Cardiff just feel for continuity purposes that he could have a role no matter what happens." Slade, who held talks with Orient owner Francesco Becchetti about his position last week, said he was "proud" to be linked with Cardiff, who were relegated from the Premier League last season. The Bluebirds sacked Malky Mackay in December 2013, with successor Solskjaer departing after less than nine months in charge. "On Friday morning, we were contacted by a lawyer close to Cardiff City and Russell Slade, who asked us to give the permission for Cardiff to talk to Russell," said Orient's statement on Monday. "On Friday evening, Russell asked the club for the authorisation to talk to Cardiff. On Saturday the general manager of Cardiff approached us in order to ask us the permission to talk to Russell. "In all cases, we denied Cardiff the permission to talk to Russell and did not authorise Russell to talk to Cardiff." Slade led the O's to third place in League One last season but saw his side beaten on penalties by Rotherham in the play-off final. The former Yeovil and Brighton manager has since come under pressure from Becchetti following a slow start to the new campaign, with Orient 17th in the table. What do you know about Russell Slade?